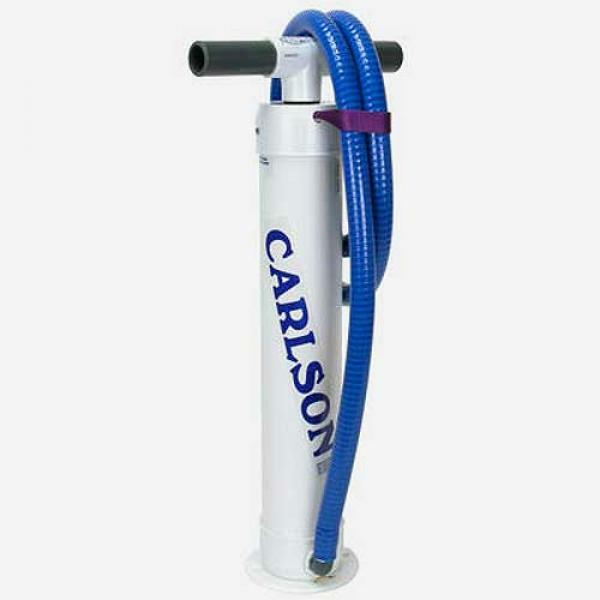 Raft pump by Carlson has a 10 Year Warranty. Available in both 4" and 6" diameters, Carlsons raft pump inflators are pretty much the industry standard. We've dabbled with building barrel raft pumps over the years and the one problem that keeps plaguing us is shrinking piston O-rings. The pumps work fine for a while, and then no air output. We had to keep manually re-stretching the O-rings. Bob Carlson is now using a new flat polyethylene washer for the piston edge seal instead of an o-ring, though he does include an O-ring in the bottom of the raft pump cylinder for those who would rather switch. Allegedly the flat washers require little to no grease - or at least won't be harmed by the lack thereof - which is a big benefit if water gets inside. Not only does the grease congeal, but it necessitates cleaning & re-lubing the raft pump. The new flat washer also does a slightly better job of expelling any water that does get inside the raft pump body. Bear in mind though that if you don't remove water that gets inside, it will end up in your boat. Although we see commercial and private boaters taking big raft barrel pumps downriver all the time, it's really not the best idea. Better to use a smaller raft pump for top-off and emergencies. Bob Carlson also uses a tool similar to a large automobile cylinder boring/ honing tool to polish the interior of the pvc tube, and to make sure it is a perfect circle, which it almost never is from the factory. These extra measures combined with large output valves insure that no barrel pump takes less effort to use than a Carlson. These raft inflater pumps have a ten year warranty. The 4" ($219) size pumps half the volume on each stroke as the 6". If you own a raft or several boats and do not use an electric pump, get the 6". If you do have an electric raft pump or only own inflatable kayaks or a tiny raft, the 4" raft pump is far easier to top off with.